Pilot got blown back over spine-back ridge in increasingly windy conditions. Pilot crashed on the lee side. Pilot with ridge on his right had mid-air collision with low airtime pilot. The low airtime pilot appeared to take no avoiding action despite having eye contact resulting in wing tips colliding. Pilot with ridge on right landed heavily but was unhurt. Student fell over during an aborted launch. Student was able to continue training. While thermalling at low level pilot had a mid-air collision with another paraglider who was ridge soaring. Pilots took avoiding action at the last moment resulting in wing tips brushing against each other. Pilots continued flying. During a kit inspection as part of guided XC week pilot discovered his parachute had been incorrectly mounted by a service centre. The parachute was impossible to deploy as the bridle had been routed down the right side of the harness and the deployment handle on the left. Pilot took off but due to thermic activity masking the true wind direction he did not realise the wind was off the slope. Shortly after take-off the pilot sustained an asymmetric collapse that turned him into the hill. Whist ground handling a student inflated his glider but tried to turn too early resulting in a collapse. During the collapse the risers brushed passed the students helmet inadvertently unfastening the new type buckle. Concurrently a line caught the helmets goggle strap (rear of helmet) and pulled the helmet from the students head. Pilot landed safely in a stock-free field and was then confronted by an irate farmer who threatened to damage his glider, standing on it in the process. Student was practicing forward launches in phase 2 of the EP. This was the student's fourth inflation. The student lost his footing on the inflation and fell awkwardly pulling his left calf muscle. 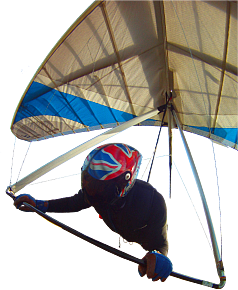 Pilot launched tandem in windy conditions and was immediately lifted off with passenger. Pilot could not see as passenger harness had become stuck over the Quick-Out karabiners obscuring the pilot's vision. Pilot was able to land after a short beat but fell on passenger on landing.